"Many of my books grew out of our real family experiences. I'm Not Moving expressed my sentiment when we were forced to move at an extremely difficult time. But I was reminded that at least we're all together and that's when I wrote the book." 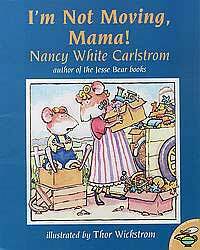 It’s moving day, and one by one, Mama packs up Little Mouse's favorite belongings. As each is packed, the youngster finds a good reason for not leaving his special places. While promising that they will always remember the joys of their old home, Mama finally convinces little mouse that "it's better being all together in someplace new." I'm Not Moving, Mama is featured in Healing Stories: Picture Books for the Big and Small Changes in a Child's Life.